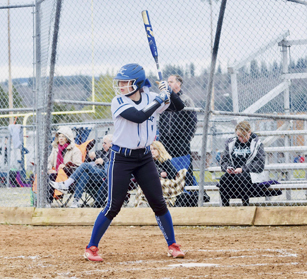 Eatonville’s Brooklynn Lucht continued her assault of opposing pitchers again last Wednesday, March 20. This time it was against rival Orting. Lucht went 4-4 with a two-run home run and a grand slam while driving in eight runs to help lead the Cruisers to a 17-0 thrashing of the Cardinals. That was Brooklynn’s third and fourth home runs of the season. Haley Olson threw a gem of a game for the Cruisers, allowing zero runs on two hits and striking out six through five innings of work to pick up the win. The Cruisers got things started in the first when freshman Hailey Rath went yard with a solo shot. She hit another home run in the second inning to match Lucht’s total on the day. The Cruisers had big innings in the second and the fourth where they scored seven and six runs respectively. Eatonville took the victory with a final score of Eatonville 17 Orting 0. On Friday, March 22, the Lady Cruisers hopped on the ferry and headed to Vashon Island to take on the Pirates in a non-league matchup. It was a close game up until the end. The game was tied at 11 as the teams went to the top of the seventh and final inning. Eatonville pushed one run across to take a 12 - 11 lead. Haley Olson then shut down the Pirates in the bottom of the inning by striking out the first two batters she saw and got the final out on a ground out to the third baseman. Olson picked up the win for the Cruisers to push their record to 4-1 on the season. The final score was Eatonville 12, Vashon 11.